If you’ve spent any time watching PBS, you probably remember Bob Ross. Bob was a soft spoken, gentle soul who, in the span of 30 minutes, created landscape paintings with a blank canvas using brushes, a painting knife and his imagination. Nothing was every wrong in his world. If something didn’t go just right, it was not a mistake but rather he referred to it as a ‘happy accident’. Despite our best efforts, not everything goes right in our bakery either. While we refuse to ship orders that are not as close to perfection as we can get, when things don’t turn out quite right we try very hard not to waste anything. If a batch is not up to spec, or we are experimenting with a new recipe, we do our best to salvage the product and create our own version of a ‘happy accident’. This is how we created Shepard’s Shortbread. 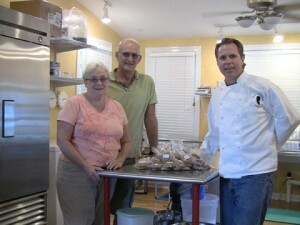 A few years ago, we were making several batches of our Artisan Cookies. The bakery was humming, mixer going, cookie helpers forming the dough and sheets going into the cooler. In an attempt to keep the hopper full, I inadvertently added the flour to the butter and sugar mixture before adding the eggs. No way to reverse this. Eggs not only provide moisture, but leavening as well. Without it, you have a basic shortbread recipe. I sat the dough aside and later rolled it out, cut it into squares and baked up some shortbread. It was really, really good. Whenever we have extra cookies or are experimenting with a new recipe, we never like to see good product go to waste. 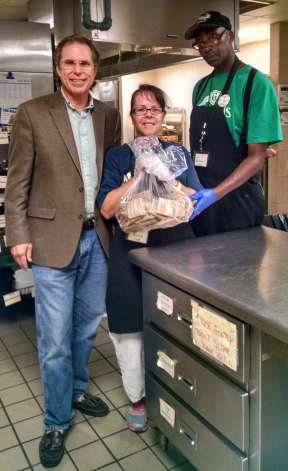 One of our favorite places to visit and donate extra product, is The Shepherd’s Table Soup Kitchen in Raleigh. They ‘Serve the Hungry and Feed the Soul’. Right up our alley. I carried the short bread down there and offered it up for their lunch. It was a hit and over the next few weeks we had a few more ‘happy accidents’ as we worked on getting the recipe and process just right. After a few rounds of testing, we decided to add it to our Artisan Cookie Tower. We named it Shepherd’s Shortbread in honor of our friends who serve those in our community in need of physical and spiritual nourishment. A few weeks ago during one of our cookie making sessions, I inadvertently forgot to add the eggs again. This time, to our traditional cookie recipe. No problem – I set the dough aside knowing that this was just another ‘happy accident’. I baked up some shortbread and dropped it off at the Shepard’s Table. Raven and Michael were more than happy to add it to the lunch menu. While I did not stick around for the lunch rush, I’m hoping that combined with the other food served up that day, the ‘happy accident’ from Anna’s Gourmet Goodies helped feed the soul of the guests who dined with them that day. That’s right in line with our mission. Bob passed away on July 4th nearly 20 years ago. We never met, but something tells me that our version of a ‘happy accident’ would meet with his approval. And while everything we do might not turn out perfect, being of service and making people happy is always a key ingredient in our recipes. As a gourmet cookie company, we certainly get our share of requests for donations. We try our best to balance the needs of the business while giving back to the community. One of our favorite groups to support is the NC Special Olympics. We’ve been providing cookies to fuel these athletes for the past several years. Bill and Darlene McKenney are friends and members of the Wake Forest Civitan Club. Members of the club volunteer and serve lunch to the athletes. This year, we added labels to the cookie packages with a few words of encouragement to support their quest to give their best effort. In addition to a great cookie, we wanted to add a little extra to help put a smile on 600 or so faces when they are giving it their all. I received another request today from an organization, and while it might be a worthwhile event, I decided to pass. They asked for free cookies as gifts and prizes for a member reception. In exchange for the gift, I was to get my name in front of 100 or so ‘potential customers’. I’m certain that I’ve lost out on plenty of promotional opportunities in the past, but that’s not the primary reason we donate. Supporting a group just to (hopefully) make a profit some time in the future is simply not my style. I like to think we put our support to work where it can really make a difference. That’s not to say I don’t get repaid many times over when we give. It just seems to come back to me when I least expect it. A surprise. A small measure of gratitude. A sign post that lets me know I’m on the right path. Last week, it came from Tim Minard, a hot dog vendor at Waterfront Park in Louisville, KY.
We ventured back to Kentucky for a weekend wedding. We spent a day driving around Louisville and decided to take my two Anna’s (that’s another story) down to the Waterfront Park on the Ohio River. The river is not for swimming, but it did not take the girls long to find water spouts to take the edge off the 95 plus degree heat. We were walking around and Debbie left her purse in the car. She is the keeper of cash in our family. 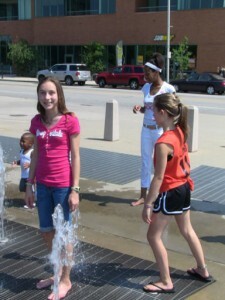 The girls asked for some water so I strolled over to the hot dog stand to see what I could find. I asked if they accepted credit cards. “No, I’m sorry we don’t. What did you need”. I explained that I was looking for some water for my daughter and niece, but had only plastic for payment. He pulled out a couple of bottles and handed them to me before I could say no. “No charge” he said. I noticed he was wearing a visor with the Special Olympics logo on it. Turns out that Tim is a big supporter of Special Olympics and recently helped raise more than $70,000. His company, Dogs on the Run, works with Special Olympics Indiana for Area 2. I could tell by the look in his eyes that he understood what it means to give something back with no expectation of a return. Just because it is the right thing to do. It was not until after he gave me the water that I shared my story of donating cookies for the athletes. Maybe it was pure coincidence, but I said a quiet ‘thank you’, smiled and enjoyed a conversation with a new found friend. 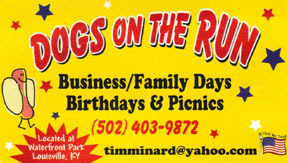 If you happen to be in Louisville, I’d recommend you get off on River Road and look for the Dogs on the Run cart. Tim will serve up a fine dog, a cold drink and a friendly smile. And you can be sure that some small measure of what you spend will help an athlete you’ll never meet at next year’s Special Olympics. You can smile knowing that you made a difference in the life of someone out there giving their best effort. In my book, that’s what it means to give something back.